FAIRMONT—Most children just want to feel like their peers. They want the feeling of going outside, feeling the wind and breathing fresh air, all as they pedal down streets on a cool bicycle that will make their friends jealous. 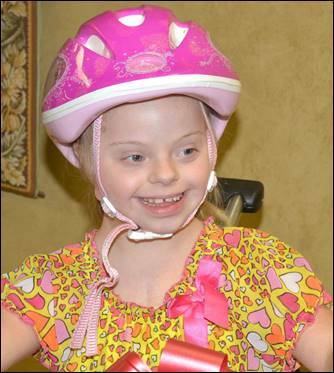 For kids with disabilities, these sensations may rarely be experienced, if at all. But Variety the Children’s Charity, in partnership with the Disability Action Center, has a program to give children those experiences. 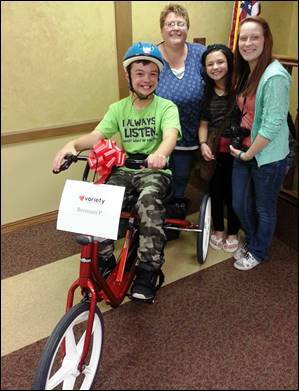 On Tuesday, Variety held a presentation at the DAC to provide 17 West Virginia children with disabilities their very own adaptive bike. The program provides tricycles to accommodate their needs, and allows them to ride freely with friends and family. For example, some bikes had special steering controls so a parent walking behind the child can assist. In addition to being able to experience feelings just like their peers, the bikes help the children’s health. For one such child, a 6-year-old Marion County boy named Aiden Morris, seeing his new bike was the thrill of a lifetime. “I’ve never seen him so excited about something,” said Erin Vilar, Aiden’s mother. Getting his bike helped the shy boy come out of his shell. Aiden wore his new bicycle helmet from the moment he walked in the DAC’s doors, an oddity given his disdain for headwear. With Tuesday’s presentation of bikes, Variety has given a total of 72 adaptive bikes to West Virginia children. The program kicked off in the state April 4. According to Variety CEO Charles LaVallee, more than 650 adaptive bikes have been sponsored for eligible children since the program started in Pennsylvania in November 2012. Each bike costs $1,800 to sponsor. Since the program started, Variety has given away more than $1 million in bikes. The charity states it has a goal of sponsoring 1,000 bikes for children in 26 Pennsylvania and West Virginia counties by the New Year. LaVallee is confident Variety will meet or exceed its goals, especially with help from local partners. The DAC in Fairmont worked hand in hand with Variety every step of the way, from helping families with applications to fitting them for bicycles to now getting the children on their new rides. While approximately 20 percent of families who apply are considered in or near poverty, Variety’s “My Bike” Program is open to families who make up to 400% of the federal poverty level. That is $94,500 annual gross income for a family of four. The program serves 10 counties in West Virginia (Barbour, Doddridge, Harrison, Marion, Marshall, Monongalia, Ohio, Preston, Taylor and Wetzel). Variety is seeking community help in identifying more West Virginia children for the program and in spreading the word and raising funds for more adaptive bikes. To apply for an adaptive bicycle, fill out the application on Variety’s website, www.varietypittsburgh.org/MyBikeProgram.asp, or call the Variety West Virginia office at 304-216-0203.